Coorg Map " Best Routes to Keep you on the Right Track "
Detailed Coorg Map* , Tourist Directions from Madikeri to other Attractions in and around coorg.Go Explore!. This is the best You can Get ! THE RIVER WATER RAFTING EXPERIENCE IN COORG is BACK [MID-JUNE to MID-OCT] , Real rafting near irpu Falls ,Dont Miss it !, 1250/ person . 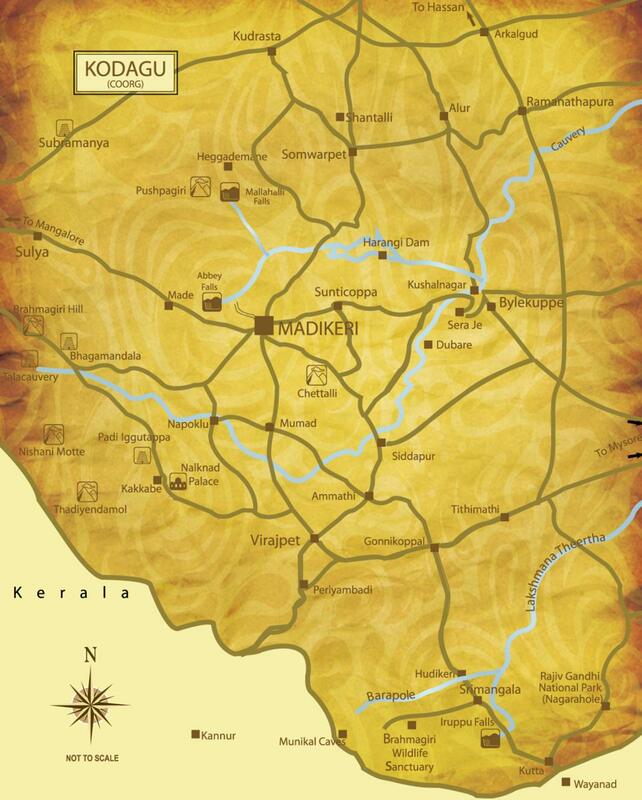 Madikeri is the Head Quarters of Coorg Dt. All Roads Leading to Major Attractions of Coorg are easily accessible from Madikeri Town. Buses From Major Cities from south like Bangalore, Mysore, TamilNadu, Kerala, Mangalore, Hassan, Mangalore,Hyderabad,Dharmasthala,Subramanya,Mumbai,Coimbatore connects to Madikeri Town.